The headline of this post says it about all. Depending on where you live, your weather overnight might surprise you in the morning when you wake up. If you get up to find an unexpected snow, you will either rush around or more likely be late to where you needed to be in the morning. 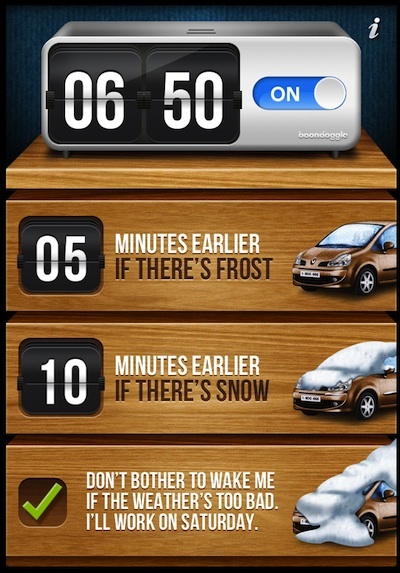 A free alarm app we found to help keep us on time in the morning is Winter Wake-Up. The app is for the iPhone but works fine on the iPad in 2x mode. The idea of the app is that it watches for weather changes where you are (you need to have Location Services turned on), then adjusts your wake up alarm time to give you extra time. Set your wake up time in Winter Wake-Up like you would any alarm clock. 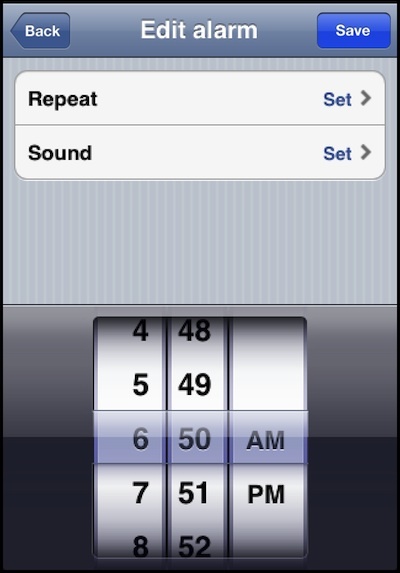 The alarm days of the week and sound is adjustable. Tap the Frost and Snow boxes to set how far in advance of the normal alarm time to be woken up so you have time to scrape windows, shovel snow or drive on ice.